Phytoplankton dynamics during the northeast monsoon was investigated in the Sulu Sea from algal pigment analysis. We visited the Sulu Sea in February 2000, a mid period of the northeast monsoon, and in November and December 2002, the beginning of the northeast monsoon. SeaWiFS images showed generally low concentrations of surface chlorophyll a (Chl a) during the southwest monsoon and higher concentrations with several peaks during the northeast monsoon. In the beginning of the northeast monsoon, subsurface chlorophyll maxima (SCM) occurred, where vertical variation in class-specific composition as estimated from pigment signatures was prominent. Prochlorococcus, cyanobacteria, prymnesiophytes and crysophytes were important groups above the SCM, and the contribution of cyanobacteria to Chl a became much lower at and below the SCM. Contributions of chlorophytes and prasinophytes to Chl a generally showed maxima near the SCM. This distribution was accompanied by vertical changes in the concentration of photoprotective pigments relative to photosynthetic accessory pigments. During the mid northeast monsoon, the upward supply of nutrients was probably enhanced at some stations due to vertical mixing, and as a consequence diatoms dominated in the upper 100 m water column of these stations, and other eukaryotic flagellates including prymnesiophytes, chrysophytes and cryptophytes were secondary major components of the community. 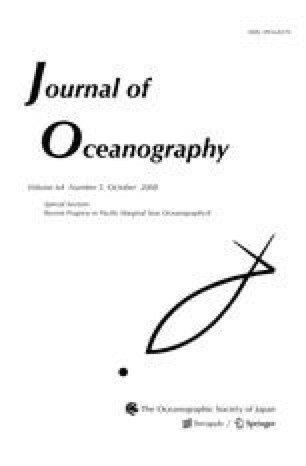 The elevation of Chl a concentration and changes in phytoplankton community during the northeast monsoon likely influence the variation in biological production at higher trophic levels in the Sulu Sea.